I love these pictures of Hailey from when we went to that corn maze and hayride recently, so here's a two-page layout I made. The circle with the date and Hailey's name is up on foam tape. 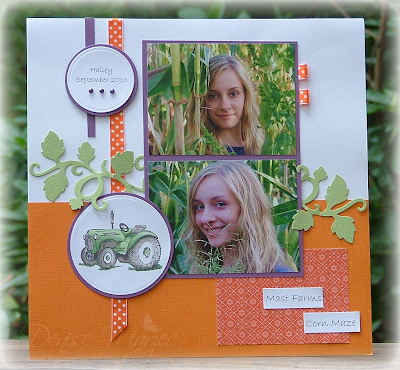 The tractor stamp is from OCL's Bountiful Harvest set. Stunning layouts Denise!!! The pictures are gorgeous and I love the little accents you added!! This is a beautiful layout. I love the vine. love your layouts, Denise! Gorgeous colours and pics! I love your layouts Denise. Layouts are something I really need to get back at!! I love how you did the vine and the colours are really very pretty! What a beautiful girl to showcase as well...she looks just like you!!!! Wonderful layout and such a pretty girl! What a wonderful layouts Denise. Sweet---I am lovin' that tractor, and of course your DD is lovely too! What a lovely layout of your sweet daughter! She looks so great in these pictures. Love that great tractor too! Look at you scrapping again! This is awesome, Denise! Great job of the page and your daughter is gorgeous--just like you! Fantastic pictures of Hailey! Love the pages you've created...so fun! Wow, these are GREAT pages of your gorgeous daughter, Denise! Everything really pops on the white background! WOW!!! Hailey's such a gorgeous young lady (just like her Mama!!) 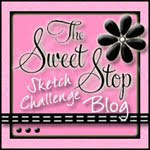 and you have showcased her pics beautifully with your awesome pages...thanks for the inspiration, gf!!! I have some pictures sitting on my counter that need to get on a page somehow...maybe I need to send them to you...LOL!! Those are great pics Denise and I love the scrapbook pages you made! I need to send you my LARGE stack of pics waiting to be put on scrap pages!LOL! Wow! What gorgeous pictures! Love them! Love your pages too! Great layouts, and I love those vines. Beautiful photos and perfect pages for them! Wow! 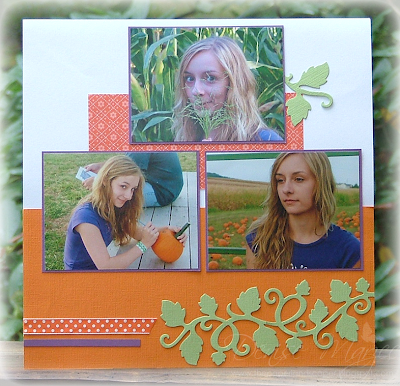 Beautiful daughter and layout!! Makes me what to scrapbook now. :) Love that vine, and the ribbons too.